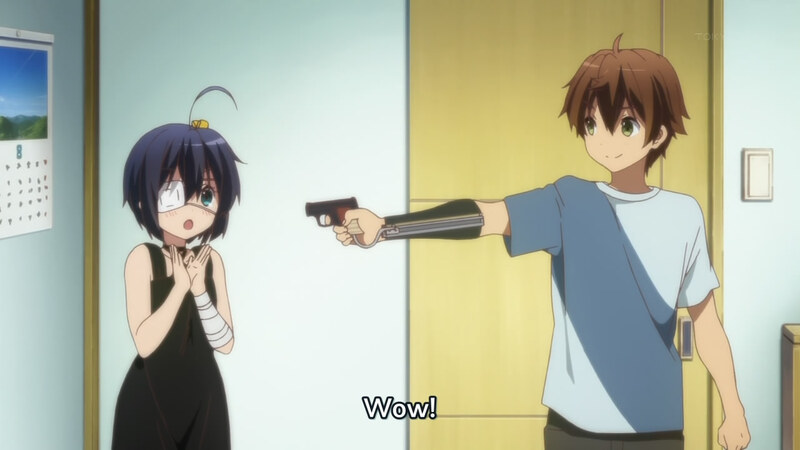 Chuunibyou Demo Koi ga Shitai OVA: And then they kiss? Well, I have no posts for today and I found this one lying around. This OVA’s been out for a while (don’t go searching for a new one), but I guess I kept it around for a moment like this. It’s actually kinda relevant because the second season is starting up this season. Anyway, after dancing around each other for so long…Sanae and Shinka show their feelings for each other. 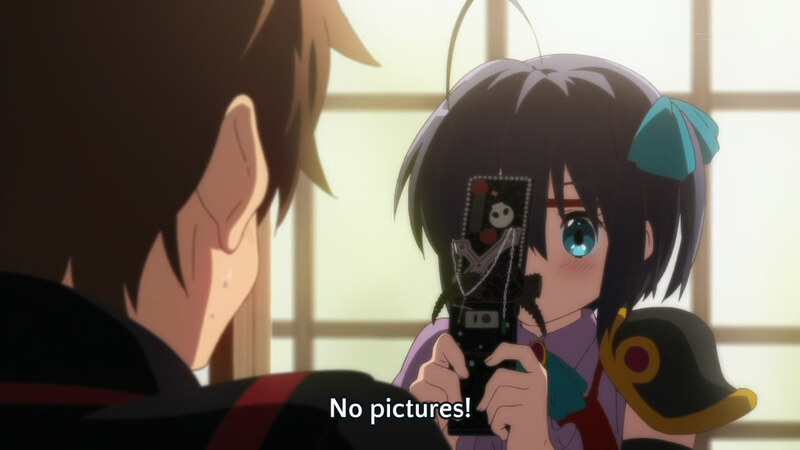 I guess Yuuta and Rikka are too pure for that. They only get the hand-holding. Not too much stuff really happens in this OVA, to be honest. Just more of the show for people who enjoyed it. For someone like me, all I was really curious about was the state of the cast after Yuuta and Rikka started going out. You could hardly call anything in it a development (we knew all along that Sanae and Shinka were like that). They’ve successfully re-established the status quo for the second season that’s supposed to be coming up. Rikka’s pretty much back to normal. She’s just got more of the love feelings now. So theoretically, the second season will be a bunch of awkward love moments, but they can still make her as crazy as she was before. And theoretically, Yuuta will hit her less…right? Author marthaurionPosted on January 2, 2014 Categories Chuunibyou Demo Koi ga ShitaiTags anime, chuunibyou, ova2 Comments on Chuunibyou Demo Koi ga Shitai OVA: And then they kiss? So that’s what this was building up to…I never considered that Yuuta would have blocked his chuunibyou days so much that he wouldn’t remember parts of it. 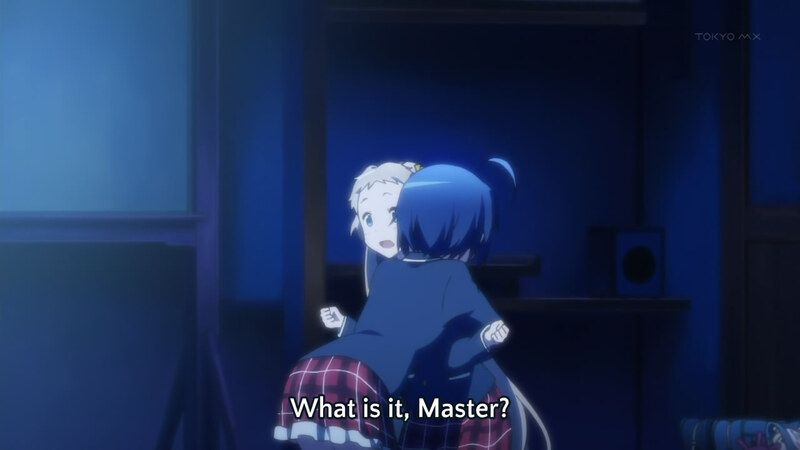 To be fair, Rikka only watched him, though…how was he supposed to know? It seems it was the father after all…Rikka still hadn’t fully accepted his death and now she gets to say goodbye. Not a bad end in my opinion, though I will say that I think the narrator at the end was unnecessary (overarching chuunibyou theme was kinda lame). 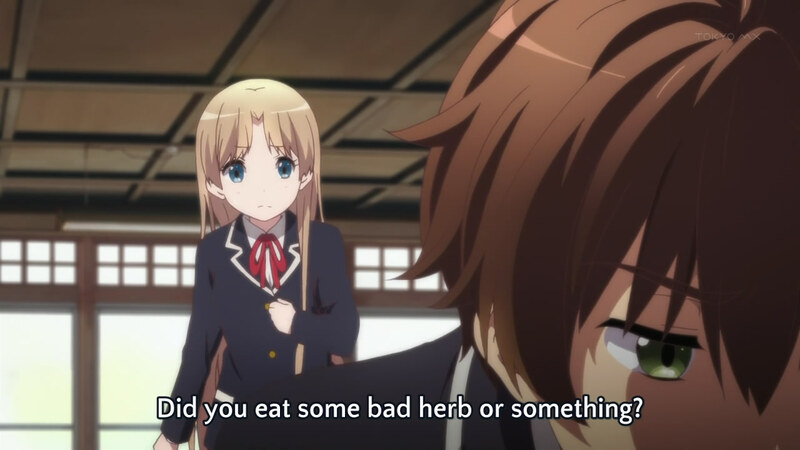 But to what extent does her chuunibyou remain? I can only hope she is more normal inside, as she retains her former appearance…the mix of the two I had hoped for earlier. A very entertaining show for this season…probably one of the better ones for me. Not as dark as I usually prefer to watch, so good for variety, I guess. Not sure if this is an ending or if it leaves open the possibility for more because I don’t know what the new character from the novels adds…we’ll see? Well this isn’t good. 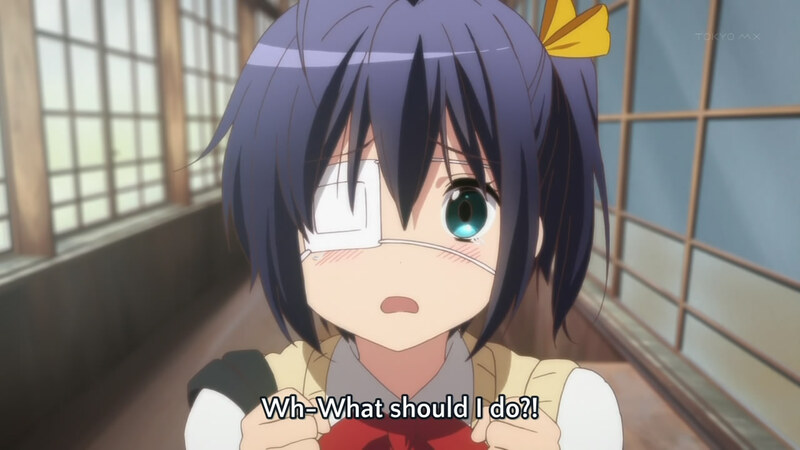 It’s not right…Rikka is forcing herself too much. She’s far too mellow (for example, it’s perfectly fine for her to react to the stones that Sanae showed her). If things continue on this way…she might relapse. And Yuuta might end up being okay with it (saying he prefers her that way). Even Shinka doesn’t really approve of Yuuta’s methods. 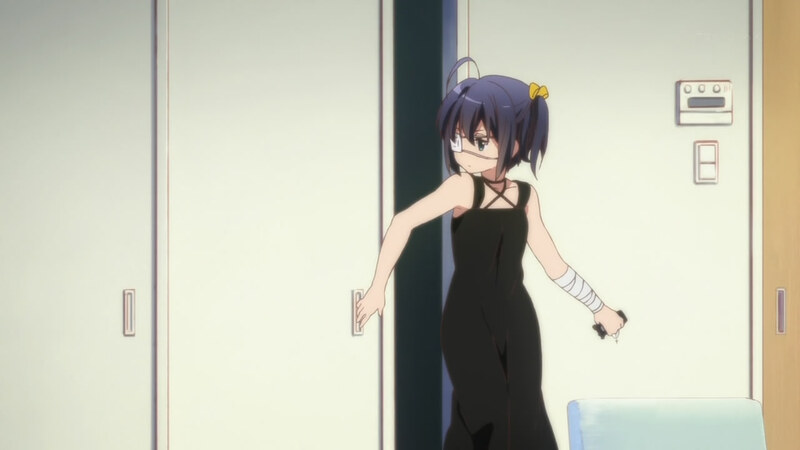 If they want to keep things open for another season or something, then the obvious course of action is the relapse…but if they’re willing to end the show, then Rikka would likely fuse her normal self with the “energy” of her chuunibyou self, so to speak. 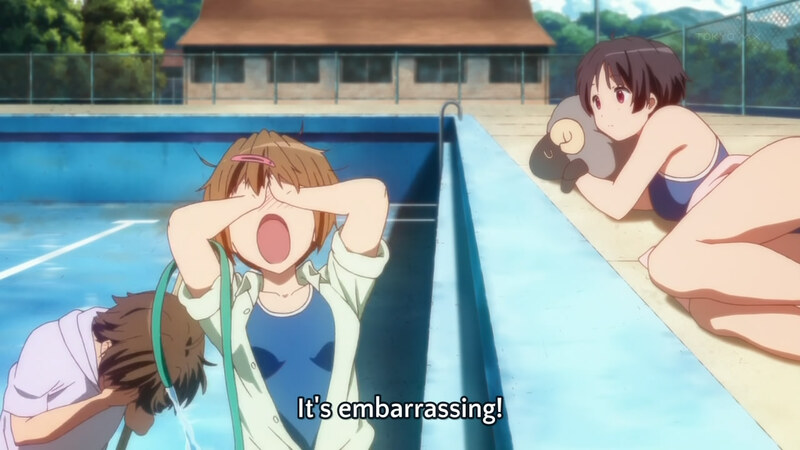 There’s also that part with Kumin that has me suspicious…did the two talk? What are they keeping from us? She sang the song…took off the eyepatch…and the contact lens. She’s becoming normal! She’s accepting it! Honestly, I think Yuuta insults her by assuming she’s still a child and unable to handle reality…I get that he’s in love with her, but he shouldn’t try to shield her from reality (because it will always be knocking). So what happens now? If I had to guess, I’d say the trek to normality isn’t so easy, so there are still some baby steps for Rikka. For example, facing her mother. I’m curious how this show ends too…will it be definite or will it hint at or lead into a new season? I know there’s stuff they’re not getting into, so there’s always the possibility. Sanae must be the next one to fall as well…there’s no one left to save her. Everyone be normal! It’s an inevitability of life, right? I can’t tell if they’re moving fast with this love thing or not. 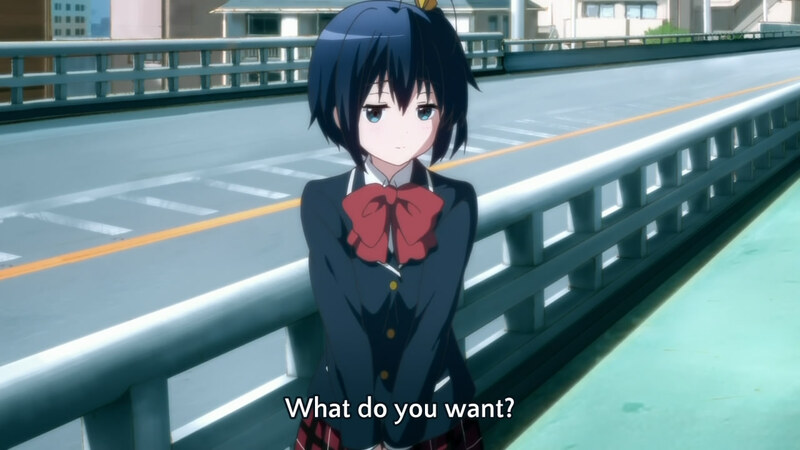 Three episodes left and Rikka looks like she’s just about to confess to Yuuta (unless he gets over his oblivious self and does it first). To be fair, he had no way of knowing that he hadn’t overstepped his bounds somehow when he found out about Rikka’s past. He knows that he didn’t now, right? Now he can figure out what she’s really feeling? Not really sure what to make of the “saving her” scene…interesting that he actually left her to run below and catch her. 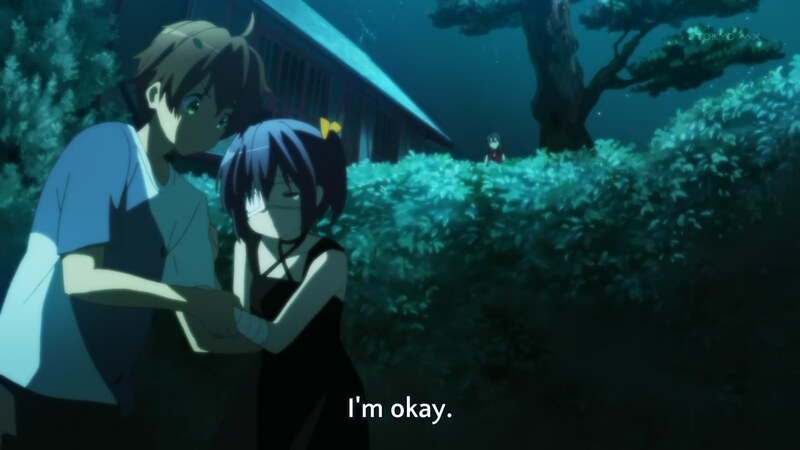 I can feel it, Rikka…I knew it was a good idea to hold out hope for you. You’re slowly becoming more normal…I can just sense it. Excellent…everything is going exactly as I planned. Still, what kind of person is Yuuta to just let her run away from her family? That doesn’t seem like usual anime stuff…usually he’d get her to stand up to them and get them to accept her. Weird. Based on stuff I’ve seen for this show…isn’t there another character? Is she even supposed to be a factor in this series? Or is she just there to give the fans hope that there will be a second season, so that they can all be trolled (if it happens, I totally called it)? Anyway, I’m not sure if this episode was supposed to be “arc-ending” or whether there’s more to it…looked finished to me. So it’s a dead father, huh? That’s what caused her to change? She wasn’t wearing the eyepatch in her flashback…it’s not a tough call to make. You know, it’s odd that Touka, who wants her to accept reality so much, would try so hard to hide the demolition of their former house from Rikka. So what’s the point of this battle, Rikka? Are you fighting to reject reality? Depressed reaction is normal, but turning on Touka, I wasn’t quite expecting. What do you hope to accomplish? She won’t be able to deny reality, though, so I take this as a step towards her recovery…because she must eventually become normal…right? 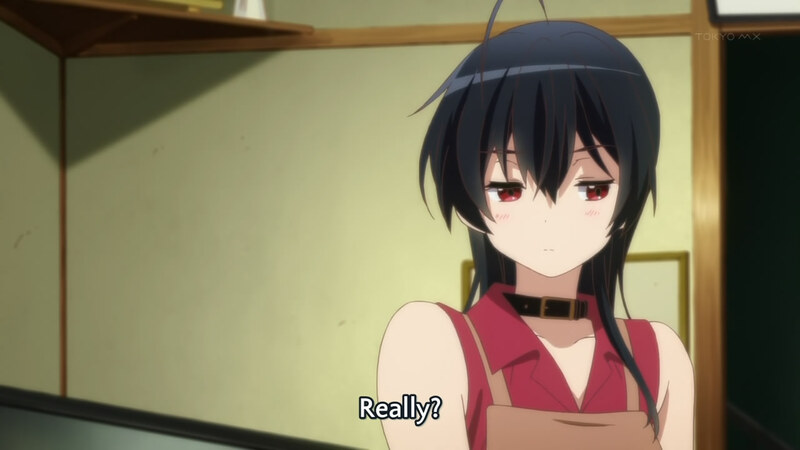 Maybe from next episode on, Sanae is the only chuunibyou in the cast? I kid of course…or do I? And now Ishiki is caught up in everything as well. Well, sort of, I guess…his role in the opening and ending are still relatively small, so I guess Kumin will just lead him around a bit…he’ll pop in for some of the group scenes like Taniguchi or something. 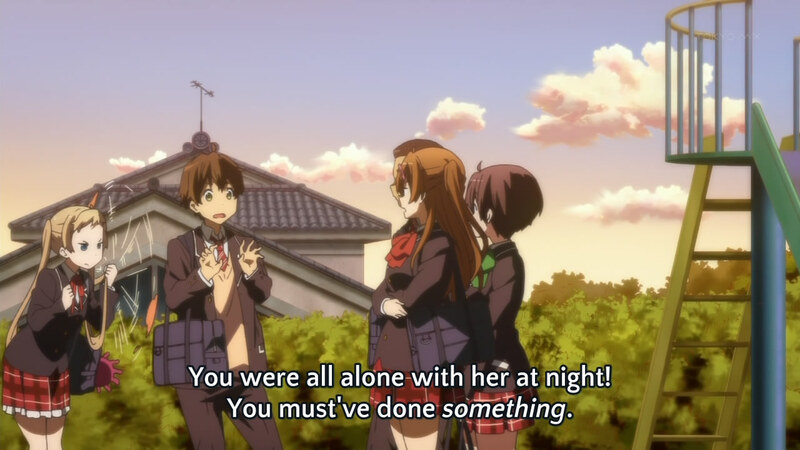 Wonder if Kumin was the original writer of the note…honestly, I was thinking it was Rikka trying to get Ishiki to join her after that conversation with Yuuta (she mentioned that Yuuta only talked to Rikka, Shinka, and Ishiki in class). Of course Sanae is a genius…it just had to be that way. Yuuta, you fool…you’re regressing! You must maintain your sanity and live on to fight against the chuunibyous! 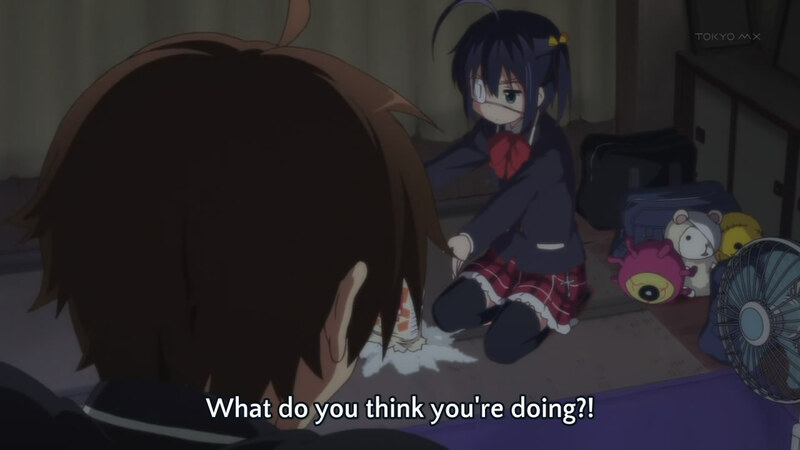 To be fair, that was a lot of pity material from Rikka…would be difficult not to express sympathy. I’m actually surprised that Shinka didn’t actively try to sabotage the two of them, though…that would have been funny to watch with the two of them attempting to dodge her and get work done…hard enough as it was already. I guess there was also that tiny hint…when they mentioned that Shinka may be having problems with the cheerleaders, leaving her with no remaining options to escape the club. 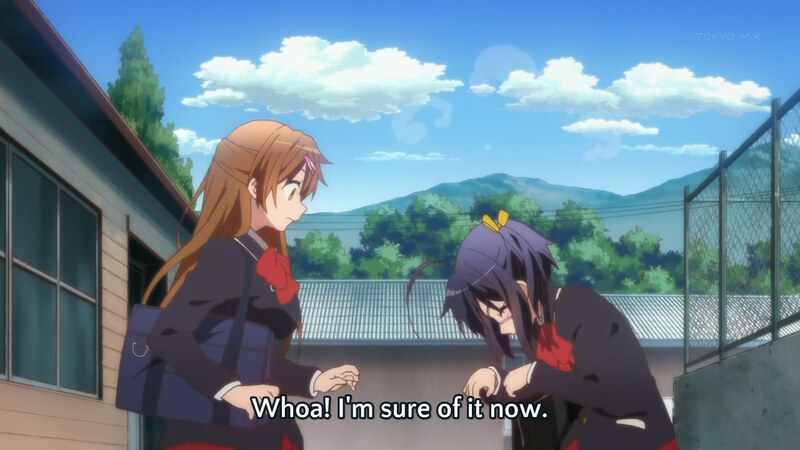 I’m not sure whether that was brought up as foreshadowing or whether they were just trying to come up with a reason to keep her from interfering with Rikka passing the exam. So…what comes next? I guess they push Yuuta and Shinka towards the chuunibyous and Sanae and Rikka towards the normal people until they all reach a medium. 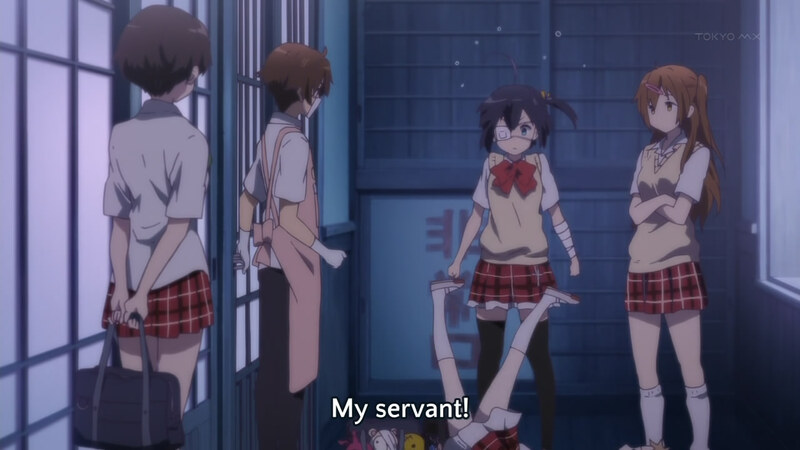 So Shinka is a former chuunibyou just like Yuuta after all…and she’s been roped into the group in the same way he has. So now we see how she truly acts…rather than that fake responsible attitude. But Mori Summer is no Dark Flame Master (Hei+Lelouch is too much win). Well, at least Yuuta has an ally of sorts now…he was outnumbered three to one before, and maybe he has a fighting chance now of keeping things…manageable? 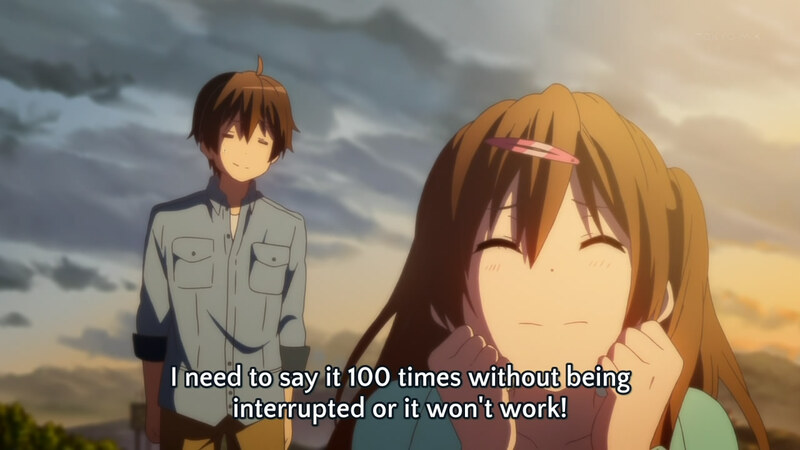 Yuuta will try to keep track of Rikka, Shinka will quarrel with Sanae, and Kumin will…sleep. I suppose they’re trying to suggest something between Shinka and Yuuta by making her former self a symbol of light while his former self is a symbol of darkness. 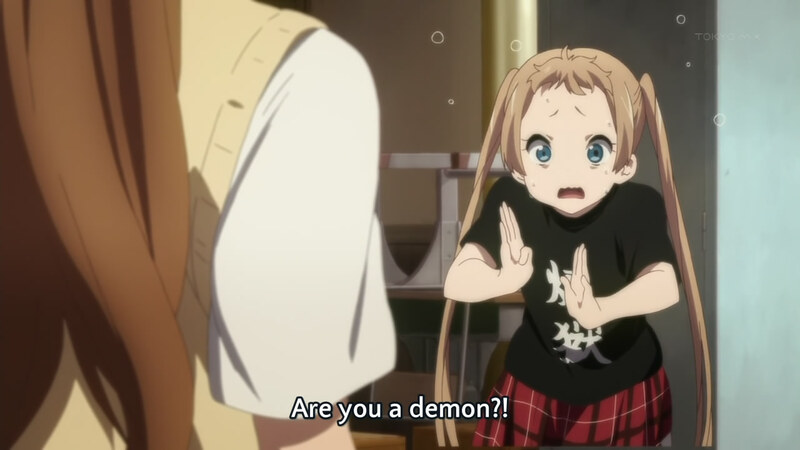 I guess Rikka’s a symbol of darkness too, so it’s like who is better suited for darkness, darkness or light? So now we have a full cast and a secret club…time to go find aliens, time tra- wait a minute. Err…time to go unlock the magical secrets of the world? 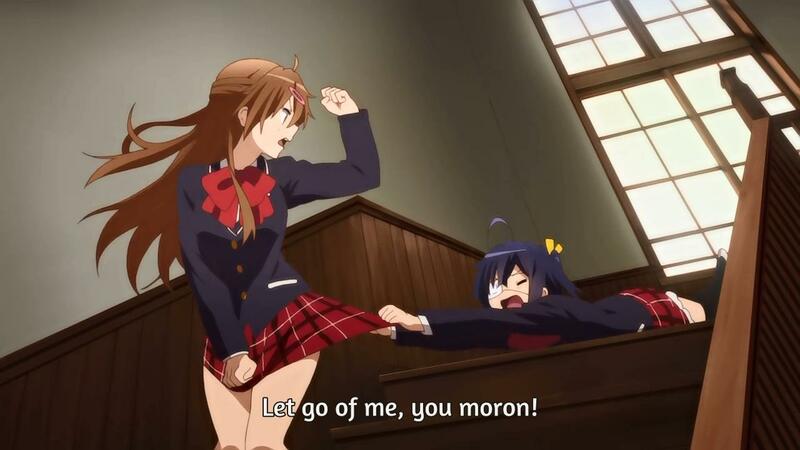 Need more Rikka antics next week…not enough this week.